Email me at paigetaylorevans at gmail dot com and I'll get your kit sent right out! Thanks for all your sweet and kind words - it means the world to me. 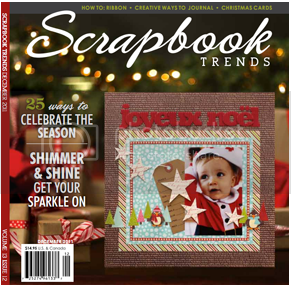 I've got some layouts and projects to share that are being published in Scrapbook Trends December 2011 and Cricut January 2012! Tip: Create a Christmas tree for your background by trimming strips of patterned paper (not necessarily Christmas-themed but still in holiday colors), cut them into pieces of descending size, then stagger them down the layout. Outline the tree shape with a stitched border to help it stand out. 1. Make twenty-eight label cuts from a variety of patterned papers and scrap cardstock. Cut the banner from aqua cardstock and carefully trim off the owl shape then set it aside. 2. Arrange the cuts across a grid background to create a pattern, adhere them in place with a temporary adhesive, then spray over the background with gray mist; remove the cuts. 3. Use a black pen to outline some of the misted shape negatives. 4. Adhere some of the middles of the cuts as well as a few of the frames back onto the background, using dimensional adhesive on a few. 5. Sew around the banner using white thread, outline it with a black pen, add a chipboard letter sticker title, then add it to the middle of the layout. 6. Place four 2” square photos above the banner and two 2” square photos below; use pop dots under two of the photos. 7. Outline a misted cut below one of the photos with silver glitter glue, let it dry, then write journaling with a black pen inside the shape. 8. Embellish the layout with different colors of glitter buttons, a heart sticker, and a sentiment banner sticker to finish. Tip: Cut multiples of one shape, set them across a background, spray over them, then remove the cuts to create a custom background. 1. Spray a green diagonally striped paper background with white and navy mist then set it aside to dry. 2. Cut a pinked circle from a variety of patterned papers in concentric sizes, layer them all together, stitch several circles around the middle using white thread, then adhere it to the center of the layout. 3. 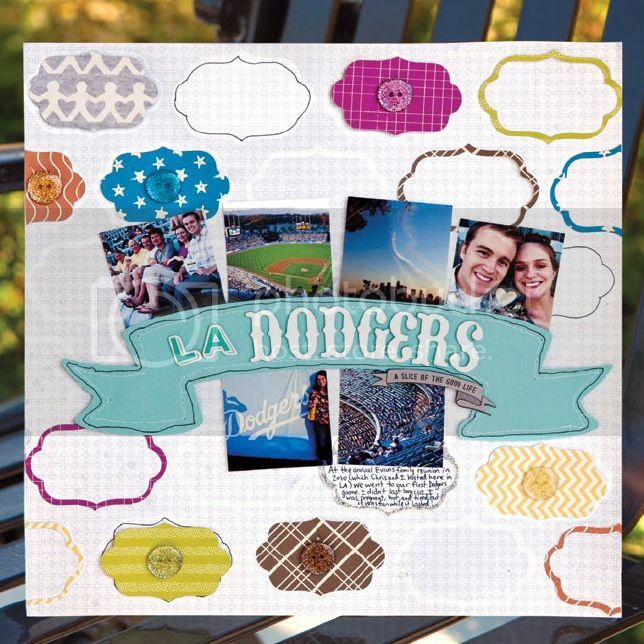 Trim a photo into a circle using pinking shears then adhere it to the center of the stacked cuts; make a title below the photo in a curve using a mixture of letter and number stickers. 4. Sew lines using white and then brown thread extending from the point of every cut to the edge of the page. 5. Cover the five sewn lines on the top right corner using a variety of patterned tearaway strips; embellish between the strips with pearls and colored jewels. 6. Write journaling on a label with a black pen, adhere it with foam squares, place number stickers of the year on a smaller label, then adhere it by the other label. 7. Pierce two heart stickpins into the foam adhesive of the top right corner of the journaling label sticker. Tip: Create a unique photo mat for your focal picture by cutting the same shape in concentric sizes. 1. 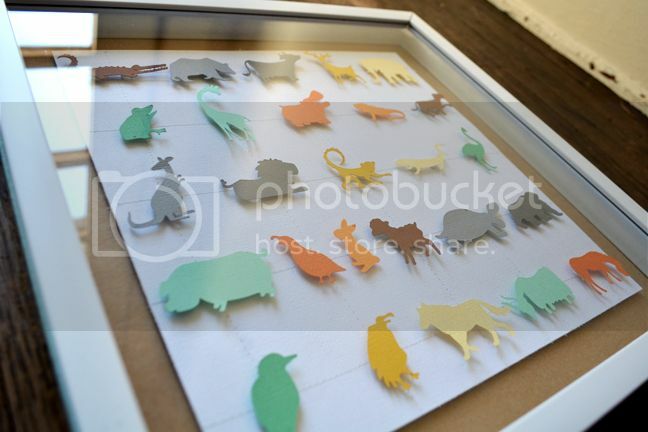 Cut a variety of zoo animals from your desired cardstock and/or patterned paper. 2. Drop green mist across a cream grid background and use a circle punch to ticket punch the corners. Trim 1/8" from each edge, mat it on kraft cardstock, then re-punch the corners. 3. Stitch a large circle three times around the layout using gray thread, then write your journaling with a black pen around the outer circle; set a green pearl at the beginning of the journaling. 4. Assemble the animal cuts using pop dots between some of the layers then adhere them around the inner circle. 5. Create the title in the center of the page using the (Phrase) cut (back the “o” with cream lined paper) and additional letter stickers, using pop dots under the word cut. 6. Place eight mini photos around the title. 7. Add a trio of kraft star stickers to the bottom right corner, top them each with a green pearl, then place a trio of chipboard clouds on the top left corner. Tip: To give your cuts more depth and dimension, place thick adhesive like pop dots or rolled up tape between some of the layers. Also, try cutting shapes from patterned paper instead of cardstock to create interesting textures and patterns. Card is 5.5 x 4.25"
1. Cut ten doves at 1 1/4" from your desired cardstock and/or patterned paper.2. Use a circle punch to ticket punch the corners of a light blue cardstock card base then straight stitch around the border using white thread. 3. Adhere the cuts across the front of the card, setting the one different colored cut aside.4. 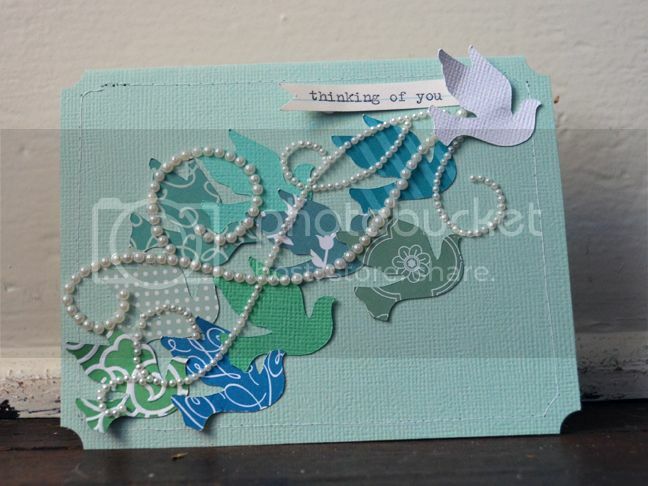 Place a pearl flourish over the cuts, then add the last cut to the top right corner. 5. Type a sentiment on a piece of cream paper, notch the left end, then tuck it under the left side of the last cut. Tip: Make one of your cuts a different color to stand out from the rest and to go along with the sentiment to let the recipient know they’re extra special. Shadowbox is 12 x 12 x 1 1/4"
1. 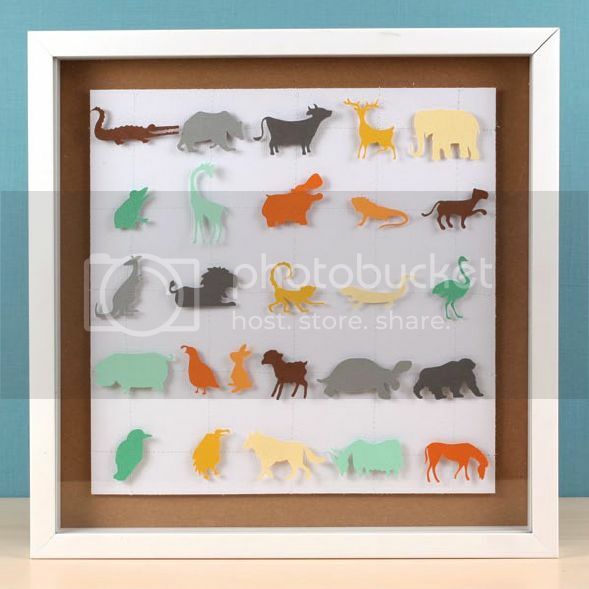 Cut 26 animals - A to Z - from your desired cardstock and/or patterned paper. 2. Sew straight lines using white thread every 2" both horizontally and vertically across a 12" square piece of white cardstock; trim 1" off every side to make it a 10" square block. 3. Adhere the cuts to the intersections of the stitched lines using pop dots. Place an extra cut on the fourth line. 4. Mount the entire piece onto a kraft cardstock background using pop dots, then place it inside a white shadowbox. 5. Glue blue polka dot ribbon around the outside of the shadowbox to embellish. Tip: Since there are twenty-six letters in the alphabet and there are only twenty-five squares, squeeze one of the smaller cuts into one of the rows, like the quail and rabbit in the fourth row. Oooooh my goodness - all of these projects are AMAZING!!!! I love LOVE the one with Fox at the zoo! Also the Christmas tree LO! WOW I'm totally going to give that a try - BEAUTIFUL!!! Wow! You always blow me away but I think these are some of my favorite layouts yet. Plus you use a cricut, which is cool because all I'm hearing is Silhouette these days, ha. I can't wait to take your class at the Crafts Beach Retreat. Seriously Amazing layouts! Your xmas tree layout reminds of me something I did too in my old layouts. The tree idea is definitely something I should try too. Everything looks awesome! Does that mean there's a picture of me in that magazine? I might have to go get a copy. okay--seriously?! WOW! these layouts are AMAZING--outside the "box" and WONDERFUL! thanks for the creative eye candy! OHHH! I cannot believe you have so many LOs published! SOOOOOOO amazing!! I love each one--but that FOX AT THE ZOO---OHHHH! LOVE how you did FOX and those animals are FABULOUS! And how cute is that little review--it's fun to find out about your family! Seriously.....how creative and amazing are your layouts?! LOVE every single one of them! All of these projects are so dang creative! I can't believe you can just keep coming up with such original designs! Second--these projects are so amazing! I love your pieced layouts. They are so unique and colorful and just awesome. Can't wait to look through the issues! 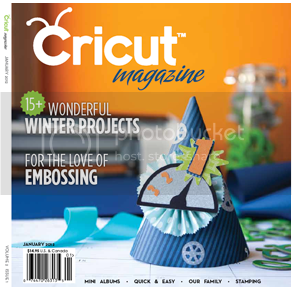 I don't get the Cricut issue but now I sure want to see it. Those projects are really cool. Wow! Where do you find the time? I love the tree layout and your card with the loves is beautiful! yay, you're back in business! that one of fox at the la zoo is by far my favorite!! too precious!!!! Beautiful layouts Paige! I particularly love the one of Fox at the LA zoo. So unique and fun. Love the whimsical way you created Fox's name with the tail. Adorable! Paige, OMGoodness come on, talent oozes from your finger tips. I love em all! these are just so stunning! each and every one! i love the tree you made with paper strips and the cool circular shape. just awesome :) Have a great weekend! I so love those layouts, what really cool details. My fav is the one of the zoo, how cute are all of the animals! Ohhhhhhhh my bug!! 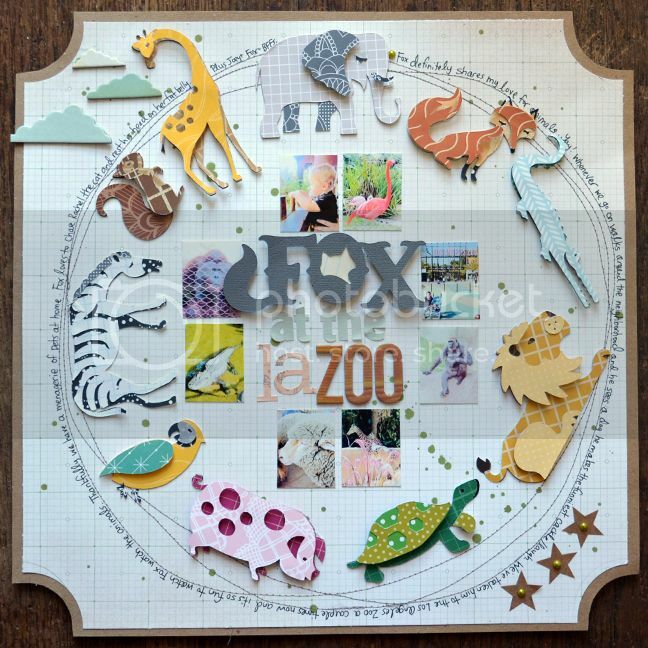 The fox layout is so amazing, not only for the circular layout, but for the animals. And all the projects with Noah's Ark, now I'm pining and very inspired, and pining lol.